5fu or 5-fu is the nickname for one of the most potent chemotherapies that mom has endured thus far. It is often used in combination with radiation therapy because it's a good radio-sensitizer. Somehow the fluorouacil makes the cancer cells more susceptible to the radiation's destroying beams. Mom's oncologist used it for this specific treatment, pairing it with her radiation therapy for this added punch. An added punch we got! Pain, fatigue, mouth sores, nausea , and vomiting. Yeah, added punch alright. But it was also the most effective treatment to date, bringing her tumor marker down more than 1,200 points. Simply amazing. 5fu was given to mom as a continuous infusion on a 24/7 basis. 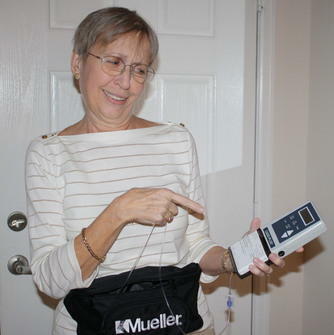 Once the radiation had begun, her doctor fitted her with a small, battery-operated pump, that slowly infused the drug into her medi-port around the clock. She wore a fanny pack around her waist with the small pump inside. Tubing went from the pump to her medi-port and could be coiled up inside the fanny pack so the excess didn't cause tripping problems. It was really a very ingenious operation. Here's a picture of mom on the day we got the pump. She had it out of the fanny pack looking it over. Somewhat dubious at first, but convinced of it's power by the end of the treatment! The 5fu was portioned to last exactly 7 days. So every week, we drove on into the clinic and they did a recheck and refill. Dr. Davis said the actual concentration of the chemo was a very low dose, but it still packed a wollop. 2 weeks into her radiation/chemo treatment, they had to pull the 5fu pump because her mouth sores and nausea were becoming debilitating. They continued the radiation, but stopped the chemo for a week. That seemed to do the trick as the nausea eased and the mouth sores healed. So on week 3 of radiation, they restarted the continuous pump. The mouth sores, pain and nausea re-appeared with a vengenance by the end of the 28 days. We decided that if mom's mouth was so blistered and raw, then the cancer cells didn't have a chance. And after that 28 day treatment with 5-fu we decided the nickname was very apt. As a matter of fact, mom thinks that all chemos should be called "fu." Not very polite I know, but we've come to decide that cancer isn't a very polite disease. This is a raw, gritty fight and cancer just doesn't fight fair. Is it any surprise that the treatment has to get down and dirty too? !